* Jharia coal fields are a rural industrial area. Debates and research about the formation of the working class tend to focus on urban industries and ‘slum cities’, while quantitatively, at least in the global South, rural industries keep on being an important sphere in the process of proletarianisation. Around 70 per cent of the population in India might still live in rural areas, but only a small minority survives as peasants. The step into urban areas is still a big step, too big for many landless, therefore a large share of proletarians in the country-side make their first industrial experiences in the rural areas themselves. Coal mining in the Dhanbad-Jharia area started on a significant scale in the early 19th century and formed a base for the development of the early working-class generations in India. * There was and still is a particular importance of the product coal itself, as an energy resource needed for industrial development – currently the regime in India sources around 60 per cent of it’s total energy from coal and has become the third largest coal producer globally. Total coal production has increased nearly sevenfold between 1980 and 2010 and India’s coal imports increased during recent years. Instead of ‘being plundered by imperialism’ India-based steel companies increasingly invest in mines in Australia, the US and Africa. But India’s energy regime is squeezed: after the nuclear disaster in Japan in early 2011 the path towards nuclear energy is contested, protest against the construction of reactors is gathering strength . India has to import most of its oil and gas – a difficult source given the inflated trade deficit and shell-shocked global oil prices. On the background of this squeeze, coal mining seems a bad, but the only stable option for the near future. * Capitalist development depends not on the mere availability of a specific energy resource, but also on its (preferably low) price for generally profitable conditions. The global crisis from the mid-1960s onwards pushed the Indian regime into nationalisation of the mining industry in order to centralise the command over productivity – the state of Emergency was the political ‘repressive’ side of re-structuring. By the end of the 1980s the mechanisation drive in the India mining industry crashed into the contradiction of capitalist productivity: output productivity increased, but production costs per ton did not come down enough. The debt crisis from the 1990 onwards focused the attack on labour costs again: casualisation and outsourcing of mines. Since the 2000s the ‘commodity price bubble’ increased the importance of mining beyond the immediate profits from production. In India the mining areas are increasingly militarised – the 100,000 para-military forces of ‘Operation Greenhunt’ are part of the investment regime. Current steps to privatise the world’s biggest coal mining company Coal India Limited – by launching a record initial public offering raising 3.5 billion USD in late 2010 – has also to be seen as an desperate attempt to deal with the rapidly increasing state debts in a global crisis. * Both output and low price depends on the control over the undesired by-product of coal mining: the control over a large mass of potentially unruly industrial workers. In the mining areas re-composition of the working class through migration, ‘uneven development’ and technological attacks is a constant process. We can see in a very concentrated local space and time struggles ‘within a proletariat’ which represent the main lines of segmentation of the global working class today. The proletariat in Dhanbad has many faces: the pauperised Adivasi (‘indigenous’) and ‘rural poor’ population at the fringes of the mining areas – main base for the Maoist armed insurrection; the village workers in the ‘illegal mines’; the casualised workers in the main mines earning ten per cent of their permanent work-mates; the unemployed sons and daughters of local peasants and permanent workers, organised in an ‘unemployed movement’. As a whole the local work-force is under-layered by various waves of migration since the 19th century. * This peculiar composition of the local work-force and industry brought about very specific forms of ‘mediation’ of class struggle. Dhanbad became infamous for its ‘mafia’, a particular network which ‘organised’ the reproduction of the working-class through money-lending and labour contracting; which reproduced itself materially as transport contractors, by illegal mining and later on real estate deals; which provided the Coal India management with both gangs of strike-breaking thugs and large integrative trade union organisations; and developed strong links with the political class. The ‘mafia-mode of production’ was not an irregularity, but a kind of complementary department, outsourced by the nationalised industry. The trade union / mafia connection in Dhanbad was historically and essentially paralleled, e.g. by the regime of Boyles United Mining Workers in the US of the 1960s and 1970s. By the 1990s the liquid force of neoliberal policies dissolved the mafia into ‘normal business’. * Parallel to, and over the time increasingly intertwined with the ‘mafia’, a ‘regionalist liberation movement’ developed, demanding a Jharkhand state independent from Bihar – the Dhanbad-Jharia mining area used to form part of southern Bihar. The Jharkhand movement first tried to mobilise the impoverished Adivasi population against ‘the outsiders’, but fairly quickly included non-Adivasi ‘Jharkhandis’, who had come to the area in the early 20th century and had developed ‘local economic’ interests in a separate state. After nationalisation around 50,000 mainly ‘local’ mining workers were replaced by ‘outsiders’ within the space of weeks; this gave material back-up for the regionalism, last but not least within segments of the working class. The emerging Maoist-influenced movement, e.g. in form of the Marxist Coordination Committee (MCC), provided the regionalist movement with an ideology of ‘anti-feudal class alliance’, later on the subaltern discourse of ‘indigenous identity’ helped to integrate segments of the proletariat into the ‘state project’. * The ‘regionalist project’ seems discarded since the formation of Jharkhand state in November 2000 and its unaltered repression and displacement of the ‘Jharkhandi’ proletariat. 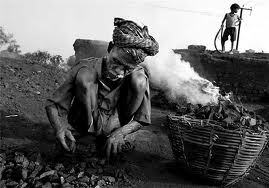 Today the working class in the Dhanbad-Jharia area has to discover and re-compose itself through its own activity. The class conflicts in the area are relentless; they reach from strikes in the mines, to piquetero-type blockading actions of the unemployed, to protests and riots against displacement and environmental damage, attacks on mining infrastructure. The questions raised by these fragmented local struggles – united by the mines and mining work – are global questions.